This post is sponsored by Pier 1 Imports. As always, all thoughts and opinions are my own. Click here to read my full disclosure policy. 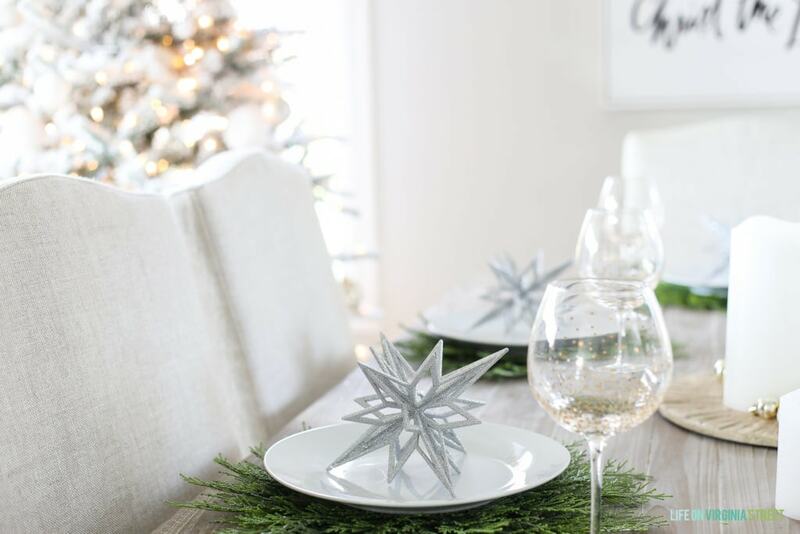 Today I’m going to share how I transitioned my fall tablescape into a winter version that works well for Christmas or New Year’s! 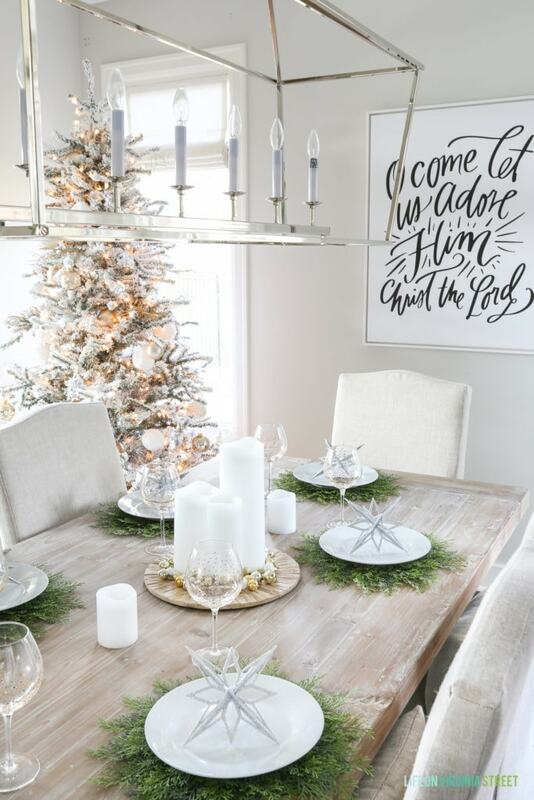 After deciding upon a flocked Christmas tree, I thought the dining room would look pretty in whites, greens, and glam metallics. A sort of glam winter wonderland, if you will. I kept it very simple, but the effect is still beautiful and festive! My fall tablescape had a more organic, cozy feel, as I personally love that vibe for harvest season. However, for Christmas and New Year’s, I’m always more in the mood for some sparkle and shine! It’s one of the few times of the year you’ll ever see me embrace a more glamorous look. I kept one or two elements the same, but otherwise, my entire tablescape got a more glamorous refresh! I turned to Pier 1 because of their beautiful, versatile and affordable entertaining and holiday products. I started with these cedar branch placemats. I actually featured these in a Wednesday Watch List last year, so when I saw Pier 1 was carrying them again, I knew I had to have them! 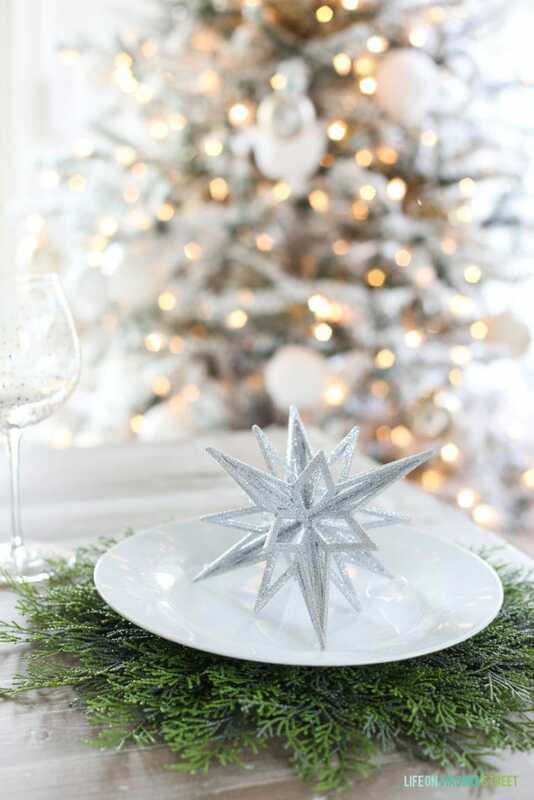 Paired with basic white plates, they create the perfect foundation for my winter wonderland tablescape. Shortly after we got our dining table, I accidentally dripped hot wax on it. Since that time, I now only trust myself with flameless candles. 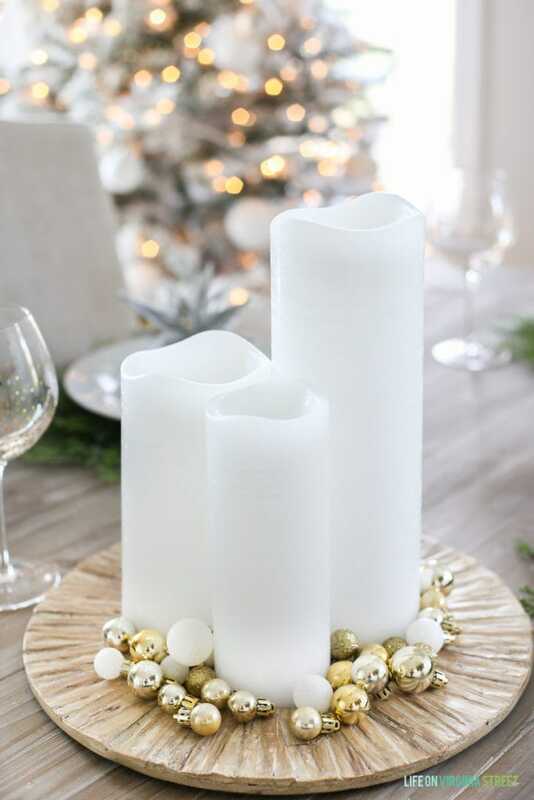 I was so excited when I found these flameless LED distressed white candle pillars and they are stunning! They are made of wax and have the look of a burnt wick so they are very lifelike. I love that you can still ‘light’ them and they have built-in timers so they’ll turn on when you want. I used one of my driftwood charger plates leftover from my fall tablescape to hold the candles and these pretty mini ornaments. 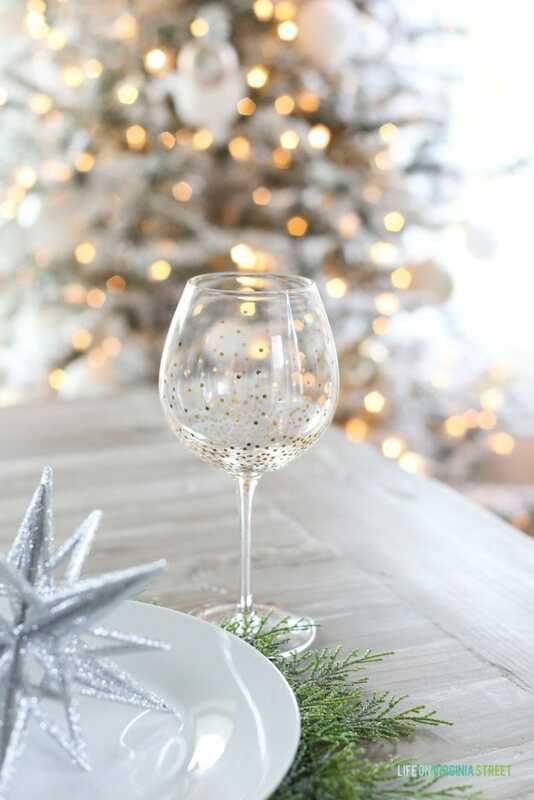 These crackle gold dot wine glasses add a bit of glam to the rustic elements, and they remind me of the sparkle from Christmas lights! However, the sparkle is subtle enough they really could be used year-round for various dining and entertaining events. I topped each plate with a silver star ornament. You could add these to your tree after your meal or leave them as party favors for your guests! I love the simple elegance of the overall look! and this glam winter wonderland look for the holiday months! You can learn more about all of these products, as well as a large, gorgeous selection of other entertaining and home decor products by visiting Pier1.com. 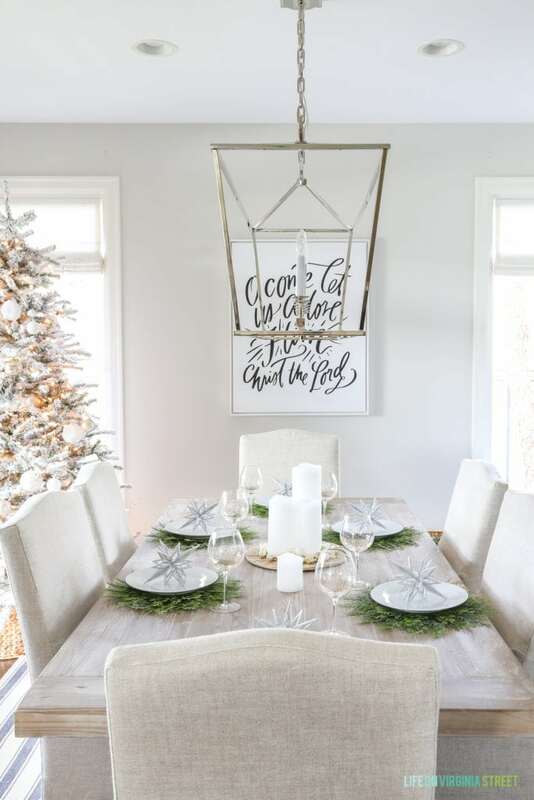 What is your holiday tablescape style? Bold and colorful or glam and sparkly? Or a combination? I’d love to hear! Hi! Awesome job, love Pier Imports! I love your table and chairs, and all your decor. Good job! Pier 1 is one of my favorite stores:)! Love all your decor and style! Where is the chandelier from? So pretty! Thank you so much! The chandelier is from Lighting Connection. Beautiful! Simple, yet stunning and perfect for your surrounding decor. Did you use real greenery as chargers under your plate or are they faux from Pier 1? Would love to mimic something similar like this because I have white square plates and can’t find square chargers that I love yet. Thanks!